If you like golden sand, bright aqua sea and pretty white towns sitting neatly atop a cliff, then you'll adore Albufeira. The pedestrianised streets of the older part of town are narrow, winding, and full of charm, with a warren of whitewashed cottages where you can still faintly see the town's Moorish roots. The choice of accommodation here is vast, but our selection of the best places to stay in Albufeira aims to recommend hotels with charm, as opposed to the enormous resort properties and chains that you'd usually imagine. There are a number of lovely beaches right in front of Albufeira, so you don't have to travel far from your hotel for that postcard perfect view. Some of the largest beaches offer all sorts of water sports gear hire, in addition to the staples: parasols and sun loungers. There are lovely beaches in both directions as you turn along the coast. Praia dos Pescadores and Praia do Peneco are just down from the old town, whilst there are also smaller and quieter beaches just a few minutes from the marina, like Praia de Sao Rafael. Those to the east are more developed, with long stretches of golden sand: try Praia da Oura, just off the Strip, or Praia da Falesia. If you prefer your beaches quieter and more cove-like try Praia de Gale. If you're looking for a fun-filled family day out then some of the Algarve's best family theme parks are a short drive from Albufeira, including Zoomarine and Krazy World. If your kids don't mind a bit of pretty architecture then it's also worth planning a trip into the hills to the little village of Alte. Albufeira also has a golf course and a horse-riding centre for travellers who plan on staying (fairly) active! Take in the truly breathtaking panoramic views from Pau da Bandeira viewpoint. Albertu's Bar is a top spot if you fancy a night out on the strip. With a buzzy yet friendly atmosphere, karaoke nights and special drinks deals, you're bound to have a wonderful time. If you're coming in the busy summer months then be sure to book ahead as the best places to stay in Albufeira get quickly booked up. If you're looking for somewhere special book the Vila Joya. The rooms are five star and the restaurant has two Michelin stars. Add to that the most spectacular ocean views in town, as well as a fabulous Ayurvedic spa, and you have one of the best places to stay in Albufeira for anyone wanting to treat themselves to every luxury imaginable. Some 17km west of Albufeira, close to Porches, you'll find Vila Vita Parc - a good option if you're looking for a resort lifestyle holiday. There's a fantastic children's club, which entertains toddlers through to teens (though not together of course! ), a nine hole pitch and putt golf course, tennis courts, boats for hire, yoga classes, a world-class spa and some of the family suites and villas come with their own pool. So if you want to treat your family to every individual luxury, this is one of the best places to stay in Albufeira. Quinta Do Mel is a traditional farmhouse set in a tranquil rural location. Offering ten simple and comfortable rooms, there are plenty of outdoorsy activities right on your doorstep while the coast is also just a short distance away. If you've decided that you'd rather the privacy of a self-catering option then browse through the wide variety available online with our partner, Booking.com. Albufeira's nicest in the summer months, with the average daily temperature rising to 23°C in July and August. This however is of course peak tourist season, so the beaches may well be crowded and accommodation will be on the pricier side of things. If you fancy a cheaper and quieter time to visit then consider coming in spring or autumn. The average daily temperature at these times is around 17-19°C, so it's still warm enough to enjoy spending time on the beach. International visitors can fly into Faro Airport, 30km east of Albufeira. Ryanair and Jet2 fly here from Stansted, whilst easyJet and British Aiways go from Gatwick. Ryanair also fly to Faro a couple of times a week from Edinburgh. From here, take the bus for 20 minutes into central Faro and then hop on a train to Albufeira which takes a further 20 minutes. Browse through our list of all the best places to stay in Albufeira. Expand your search to include all our Algarve recommendations. 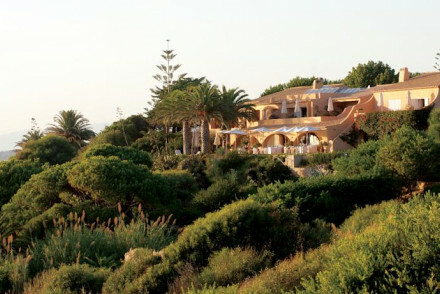 Exclusive cliff-top family resort with Moorish-style accommodation in lush gardens. Contemporary, light rooms with white on white decor drawing the eye to the spectacular sea views. Fantastic children's facilities, tennis courts, golf course, luxurious spa, and excellent food. A beach paradise. Families - Loads of kiddie stuff so parents can unwind- playground with trampoline, swings and slides, kids club, creche and pool. Foodies - Eight onsite restaurants to choose from- we recommend the tasting menu from two Michelin Star Ocean with wine pairing. Diving - Vila Vita Parc run dive certification courses as well as courses in underwater photography& deep sea diving. Fishing - The concierge will organise for guests to head out on the ocean and try their hand at deep sea fishing. Two-star Michelin restaurant with five-star rooms, fabulous spa, and majestic sea views. Moorish style architecture and the use of "azulejos" tiles maintains a traditional feel. An abundance of activities on offer within the hotel. A truly indulgent stay. Foodies - Chef Dieter Koschina runs the Two Michelin Star restaurant- phenomenally tasty, locally sourced and utterly inspired cuisine. Spa breaks - An indulgent spa with extensive therapies including Swedish massage, aromatherapy and reflexology.